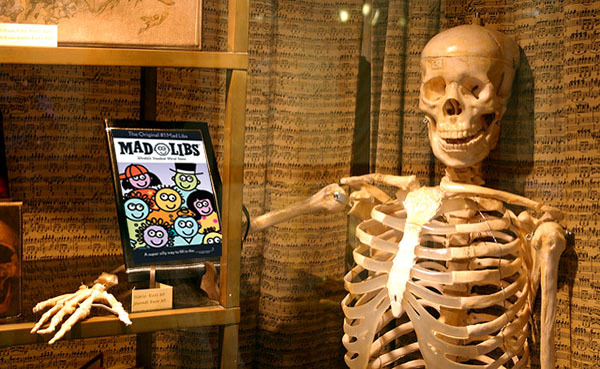 A Life Insurance Mad Lib! I don’t know if I mentioned this, but that Best Man’s speech I gave the other weekend included a pretty epic Mad Lib in the middle of it. Hello! My name is Sponge Bob SquarePants, and I’ve known today’s couple for a million years. I doggie paddled all the way from Dinosaur World to get here, and I am beyond stinky that [groom] & [bride] are tying the knot! There has never been a more naked couple than those two, and I hope they have 13 slimy babies together. My Best Advice? Don’t forget to kick the green burritos before going to bed every night! And [groom], always tickle [bride]’s belly button after a long fight. You may be scared, but true soccer balls last forever. Now ladies and hedgehogs, please raise your light sabers for the slippery couple, and may they have a lifetime of health, happiness, and everlasting ninja turtles! [Entire toast can be found here if you want to steal it. In any event, I can’t tell you how great it felt afterwards, and immediately proceeded to the dance floor to celebrate my victory. Not unlike knocking out << get ready for the slick transition! >> personal finance matters that we really don’t want to deal with either! Whether out of fear, lack of knowledge, or just being completely bored by it! I’m a little late to the party here (we’ll call it fashionably late), but in case you weren’t in the know either, September is officially Life Insurance Awareness Month, so my job today is to tell you all the reasons you should have some, and then hopefully motivate you to go out and make it happen afterwards. When you die, it’s going to cost money! Why not help cover the costs of your own death? And picking up life insurance doesn’t have to be super complicated, or even expensive for that matter. Here’s what we’ve got going on for about 10 years now – and I honestly haven’t thought about it much since, except to check in every now and then and see if it still makes sense (which I think it does?). It’s all through USAA – my go-to company for all financial products (thanks dad! ), and the money should be more than enough padding to secure the future of our finances. Whether that’s fully paying for a house down the road, funding our 3 boys’ tuitions, or just investing it for another 18 years so my wife can retire like a BOSS when the kids are finally out of the house. So yeah, we like Term here. Particularly for those who are relatively young and healthy. Now onto the part of me trying to get you to take action if you haven’t already! And staying on theme here, I’d like to do that by making you channel your own inner-child today and fill out a Mad Lib :) The first one’s for those who don’t already have insurance, and the 2nd one is for those who do – in hopes the insight you share might help the others to finally pull the trigger! Fill it out, copy and paste it in the comments, then print off and get busy! Hello! My name is [name] and I haven’t looked into life insurance yet because of [excuse]. I vow to change that today though because I’m [adjective], and I promise all my [net worth number] that I will look into it as soon as I finish filling out this [adjective] Mad Lib. If I don’t, J. Money gets all my money and future naming rights to my [plural noun]. Now a Lib for those already insured… Fill out as much as you can so it helps others get a better idea of this stuff and make the unknown a little less scary. Hello! My name is [name] and I picked up [type of life insurance] over [years] ago when I was [age] years old. I currently pay [amount] a month for it through [name of insurance company], and I am relatively [healthy or not healthy]. I chose them because [reason], and so far I am pretty [adjective] with them. If I had one piece of advice to give to anyone shopping for life insurance today, it would be [advice]. Your friend in finance, [adjective] [name]. Drop your answers in the comments below, and let’s see if this works as well as my toast! Too true! Never occured to me that I had to plan for this one too! Hello! My name is Mr. r2e and I picked up term life over 22 ago when I was 28 years old. I currently pay $63 a month for $900,000 in coverage through Transamerica, and I am relatively healthy. I do not remember why I chose them, and so far I am pretty satisfied with them. If I had one piece of advice to give to anyone shopping for life insurance today, it would be ALWAYS go with term insurance. A few more pieces of advice, 2) Personalize the rule of thumb of 10X your salary, 3) get coverage on both spouses/partners, 4) get a LONG period contract ( I bought 30 years) to have a policy in place when you are beyond retirement. Your friend in finance, Term Life Guy Mr. r2e. Hello! My name is Mr. Rounding the Bend and I picked up 20-year term life insurance over 18 ago when I was 38 years old. I currently pay $64 a month for it through West Coast Life, and I am relatively healthy. I chose them because of a good price for a high-value policy, and so far I am pretty satisfied with them. If I had one piece of advice to give to anyone shopping for life insurance today, it would be buy a large 20-year term policy around the time your kids are toddlers. Your friend in finance, Mr. Rounding the Bend. Agree with all the longer-term plays here. Much better to pick up while younger and healthier than later! And we ain’t getting any younger, that’s for sure. Mr. Rounding the Bend, now that you’re close to the end of those decades, are you still happy with your choice of a term of 20 years? Or do you wish now that you had chosen say 25 years or 30? Hello! My name is MKC and I picked up term life over 6 ago when I was 48 years old. I currently pay $70.76 per quarter for it through Cincinnati Financial, and I am relatively healthy. I chose them because they had the best rates due to bundling with auto/home insurance, and so far I am pretty okay with them. If I had one piece of advice to give to anyone shopping for life insurance today, it would be Do Not Buy Universal Life!! $70 per quarter – wow! That is cheap! Hello! My name is Paul and I picked up Term life over 7 ago when I was 30 years old. I currently pay $450/year for $1MM through Banner, and I work out and am healthy enough to pass a life insurance companies blood test without any issues. I chose them because of their rating and cost, and so far I am pretty ok with them, I mean…I don’t like to think about it. If I had one piece of advice to give to anyone shopping for life insurance today, it would be to use expenses as guidance for selecting the amount instead of 10X your salary (do this if you think there is a reasonable chance you will make more money in the future). I did 10X my salary at 30 and now my insurance number seems a little low for my family honestly. I mean financially it would be easy for my wife but not without compromise. Your friend in finance, but really I don’t know you and we aren’t friends, you might actually be some weirdo so keep your distance. But good insight on that salary stuff! I didn’t forecast anything when signing up and just based on paying off our mortgages at the time… Not sure if I could have been convinced to pick up *more* insurance at the time, but looking back I wish I had – especially with three kids in tow now! This post reminds me of your letter to your wife after your gone. Especially the paragraph about how to spend the Life Insurance(so maybe you have a little say). Guess it was September 2016, time flies. Those were excellent term life insurance rates. My wife and I also have only term life insurance. Her’s $300k and mine’s $350k. We both just recently had a physical exam, and we’re both in good shape. Thanks for your article, it may be a good time to review our life insurance policy again and see if we can renew/extend/modify them. We’re with AGI and Trans America, but I’ll take a look at USAA and see if a new policy is a better option. Can’t hurt, that’s for sure :) Let me know if you end up making any changes. Hello! My name is Stacey and I haven’t looked into life insurance yet because of the cost and wondering if I needed it. I vow to change that today though because I’m cool like that, and I promise all my $78,000 that I will look into it as soon as I finish filling out this aggravatingly real Mad Lib. If I don’t, J. Money gets all my money and future naming rights to my feet. I need to look into life insurance! I’m embarrassed to say I still haven’t done that!! Hello! My name is Mrs. Chin and I picked up over a million term over 16 years ago when I was 30 years old for both my husband and I. I wanted to be able to send the kids to private school and college and be able to retire. And I wanted him to be able to hire a housekeeper, driver for the kids and a chef I currently pay $255 a month for it through Northwestern Mutual, and I am relatively not healthy now. I chose them because a good friend started selling life insurance, and so far I am pretty happy with them since a big part of the bill is a policy added after my husband developed high blood pressure with them. If I had one piece of advice to give to anyone shopping for life insurance today, it would be just do it! It’s creepy to think about your own death and a general pain in the tush to research, set up and do that stupid health screening (They came to our house at 5 in the morning!!! My blood pressure was so low the guy asked if I was alive! I guess that’s why I’m not a morning person) but afterwards it brings piece of mind especially when your seeing the cost of college when starting the college process for the kiddos. Luckily my two kids are in college with great scholarships so if hubby goes I’m gonna be living It up! Well, let’s be honest, I’ll be investing like crazy! I don’t have a mad lib, but a personal example. I practically had to twist my husband’s arm to buy term life insurance through his job many years ago. When he literally dropped dead at the age of 51, it made a big difference to me in being able to stay in my house. If your employer offers it, there is no reason not to get it. It is usually cheaper than on the free market and it can make a big difference to those you love. Hello! My name is [Eric] and I picked up [term life] [today] when I was  years old. I currently pay [$14.57] a month for it through [USAA], and I am relatively [healthy]. I chose them because [they rock! ], and so far I am pretty [stoked] with them. If I had one piece of advice to give to anyone shopping for life insurance today, it would be [JUST DO IT – because I did too :)]. Your friend in finance, [newly insured] [Eric]. EXCELLENT!!!! Way to go man – that is the best thing I’ve seen this morning so far, thanks for telling me so! So how would u figure your investments hv u covered and dont need life insurance? The older i get the priceyer it is to get a new term to repkace expiring term. It does get more expensive usually as you get older for sure :( I know some people who don’t insure at all since they have plenty of money to cover them now and forever, but of course it all depends on what “enough” means to you and what your future vision/goals are for those you leave behind. If you think you’d be better off with life insurance, I’d def. encourage you to work on getting some now vs later as we aren’t getting any younger! Hello! My name is Jim and I picked up term life insurance over 10 ago when I was 35 years old. I currently pay 37.50 a month for it through Northwest Mutual, and I am relatively healthy. I chose them because a friend worked there at the time, and so far I am pretty ok with them. If I had one piece of advice to give to anyone shopping for life insurance today, it would be to do your research and know how much coverage you want before asking for it. Don’t let your agent talk you into a grossly inflated amount without fully understanding your financial situation. Remember, you want to be worth more alive than dead! Isn’t the point of all this saving and investing to reach FI thus making yourself self-insured? You almost have 1 M net worth so why pay monthly fees for only 350k? Invest that $35 a month. I see life insurance as a scam, my parents do too as they are self-insured and retired now. If they die they have more than enough money to fund the most extravagant funeral although knowing them the most modest one will do. Sorry, but I can’t ever see myself buying life insurance. Hello! My name is Mr. State and I picked up term life insurance over 3 years ago when I was 29 years old. I currently pay $26.25 a month for $520K (20yr Term) of insurance through the Knights of Columbus, and I am relatively healthy (A rating from Insurance Co. based on blood and urine tests*). I chose them because of their great reputation, and so far I am pleased with them. If I had one piece of advice to give to anyone shopping for life insurance today, it would be to stop procrastinating and just do it. *The blood and urine tests actually found some underlying health concerns for my wife, which was a blessing in disguise as it allowed her to seek treatment immediately. All is good now! Your friend in finance, Flyover State. Oh wow – I’m glad it revealed them for her! Super fortunate indeed! Hello! My name is Petra and I picked up a term life insurance plan over 10 years ago when I was 25 years old. I currently pay roughly $30 a month for it through a Dutch insurance company, and I am relatively not healthy. I chose them because they already were my home insurer and the offer sounded reasonable, and so far I am pretty happy with them. Plus still alive (yay). If I had one piece of advice to give to anyone shopping for life insurance today, it would be to buy term life insurance that lasts long enough for your dependents to become independent, OR long enough for you to become wealthy – whichever comes first. I like the last part of your tip, there :) And that you’re still alive too – woo! Previous post: Who handles the $$$ in your household?